It is served cut in fine slices. It is ideal with semi-hard cheeses and dark ale. It can be enjoyed cold and cut into thin slices, but most people prefer to cook it. Noumboulo or Nouboulo Foumikado is a first quality traditional Corfiot delicatessen made of a whole piece of pork fillet which is marinated in local wine and seasonings, put inside a natural intestine, slightly smoked by burning of aromatic branches, and left to mature naturally until it acquires a delicate flavor. A traditional cold cut from the region of Anogeia, in Crete, made from lean pork meat cut in strips. The meat is then marinated for 2-3 days in vinegar and spices (cumin is a must) and sometimes some mint. It is then smoked by burning wood together with sage and thyme branches. 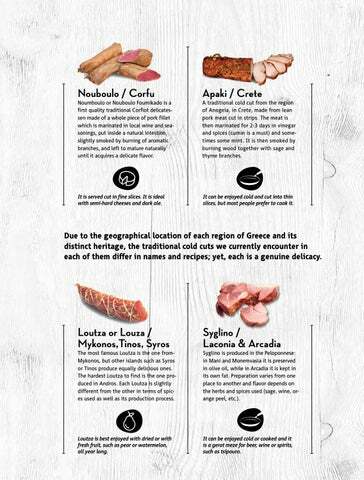 Due to the geographical location of each region of Greece and its distinct heritage, the traditional cold cuts we currently encounter in each of them differ in names and recipes; yet, each is a genuine delicacy. The most famous Loutza is the one fromMykonos, but other islands such as Syros or Tinos produce equally delicious ones. The hardest Loutza to find is the one produced in Andros. Each Loutza is slightly different from the other in terms of spices used as well as its production process. Syglino is produced in the Peloponnese: in Mani and Monemvasia it is preserved in olive oil, while in Arcadia it is kept in its own fat. Preparation varies from one place to another and flavor depends on the herbs and spices used (sage, wine, orange peel, etc.). Loutza is best enjoyed with dried or with fresh fruit, such as pear or watermelon, all year long. It can be enjoyed cold or cooked and it is a gerat meze for beer, wine or spirits, such as tsipouro.